Bill Rivenbark joined the School of Government at the University of North Carolina, Chapel Hill in 1999. Prior to that, he worked for the city of Greenville, S.C., in various management positions. His research at the School of Government primarily involves performance and financial management in local government and has appeared in Government Finance Review, Journal of Government Financial Management, Journal of Public Affairs Education, Journal of Public Budgeting, Accounting & Financial Management, Popular Government, Public Administration Quarterly, Public Finance Review, Public Performance & Management Review, and State and Local Government Review. He also is coauthor of Performance Budgeting for State and Local Government (M.E. Sharpe, 2003). Rivenbark earned a BS from Auburn University, an MPA from Auburn University at Montgomery, and a Ph.D. from Mississippi State University. Amy Tuck currently serves as Special Assistant to the President of Mississippi State University and Executive Director of Campus Operations. In her role at MSU, Tuck is responsible for providing vision and strategic leadership for campus services and interacts with state, federal and private sector officials to facilitate the university's economic development efforts, provide consultation on public policy issues and interact with a variety of state and national organizations. Ms. Tuck was elected lieutenant governor of the State of Mississippi in 1999 and was re-elected in 2003. She served eight years as Mississippi's lieutenant governor. Prior to serving as lieutenant governor, Tuck was Secretary of the Senate, overseeing the day-to-day operations of the Senate, earlier serving as a State Senator for five years. Ms. Tuck is a graduate of Mississippi State University where she received her bachelor's in political science and a master's in public policy and administration. In 1989, she received her Law Degree from Mississippi College School of Law. In 2009, Ms. Tuck was recognized and honored as one of Mississippi's 50 Leading Business Women by the Mississippi Business Journal. Ms. Tuck was appointed by President Bush in 2008 to The President's Commission on White House Fellowships. Ms. Tuck is the only Mississippian to serve on this prestigious commission. She was the 2007 Mississippi State University Alumna of the Year - College of Arts and Sciences. She is the former Chair of the Go Red for Women Committee 2007 of the American Heart Association. Ms. Tuck has served as Honorary Chair for the Susan G. Komen Race for the Cure and also served on the board of the Oktibbeha County American Red Cross. She is a member of the Starkville Rotary Club, where she is Chairman of the Community Service Committee. She is also currently serving as Chairman of the Board for the Greater Starkville Development Partnership. Tuck is a former Chair of the Southern Region of the National Lt. Governor's Association and past member of the NLGA Executive Committee. She served as Chair of the Higher Education Appreciation Day Working for Academic Excellence 1999-2007. She is a board member of the Greater Starkville Development Partnership and an Executive Council member of the President's Commission on the Status of Women. Ms. Tuck is an active member of the Women in Higher Education Network as a representative for Mississippi State University, and is a member of the Official Mississippi Women's Club. She has been a strong advocate for education, from K-12 through higher education, economic development, healthcare and protection for senior citizens, public safety and civil justice reforms. Chelsea Kellum is a graduate of Mississippi State University where she earned her bachelor's in geosciences and a master's in political science. She is currently enrolled in the University of Southern Mississippi's International Development Doctoral program. Chelsea serves as Director of Children's Ministries at Livingston First Baptist in Livingston, Ala. She will also be an adjunct instructor at Mississippi State University in the Fall of 2010, teaching Introduction to Comparative Politics. Chelsea has been an avid supporter of international missions for the past five years. She has volunteered through organizations such as the International Mission Board, Mississippi Southern Baptist, and SCORE International to travel to multiple countries: including, Ukraine (2005), Sri Lanka (2006), Canada (2007), Ghana (2007), Columbia (2009), Australia (2009), and Haiti (2010), to provide relief and aid in development of the state, local community or church. Some of the projects she worked on include digging new wells to eliminate salt water contamination, HIV/AIDS education programs, Indigenous cultural development, and natural disaster clean-up. Michelle Barlow is currently the Chief of Staff for U.S. Senator Roger Wicker (R-MS), a seven-term Congressman who was appointed to the US Senate on December 31, 2007, and elected on November 4, 2008. Senator Wicker is a member of the Armed Services; Commerce, Science and Transportation; Foreign Relations; Small Business and Entrepreneurship and Veterans' Affairs Committees. A native of Clinton, Miss., Michelle was a John C. Stennis Scholar and received her bachelor's in political science from Mississippi State University in 1997. She began her Capitol Hill career with Mr. Wicker immediately following graduation from MSU. After two years, Michelle returned to Mississippi as Director of Special Projects at the Mississippi State University Foundation. She created a premier scholarship program, raised funds to endow the scholarships, and coordinated donor recognition. She also raised annual funds for unrestricted use by the university's president. In April of 2001, Michelle returned to Mr. Wicker's Washington, D.C., staff and was promoted to Deputy Chief of Staff in 2004 and Chief of Staff in February of 2006. Her responsibilities include managing his Washington, D.C., and Mississippi staff and events, as well as overseeing correspondence, policy initiatives, and political efforts. Michelle Barlow is an active member of Capitol Hill Baptist Church. She also participates in the Mississippi Society of Washington, D.C., and the Washington, D.C., chapters of Mississippi State University Alumni Association and Bulldog Club. Bill and Adrienne met in the Department of Political Science and Public Administration. They were married in 1980, the day after they graduated! Bill received his law degree and Adrienne earned her MBA at the University of Georgia. Bill has been active in agricultural law for 25 years. His work experience includes the USDA Office of General Counsel, Senior Counsel to the Senate Agriculture Committee, General Counsel of the National Cotton Council of America and private practice for the last seven years. He established his own firm in 2005. Adrienne worked for a defense contractor and IBM before looking after their family full time for several years. Throughout his career, Bill has been heavily involved in agriculture, international trade, conservation and environmental issues. He has represented the United States and private interests in negotiations with foreign countries, serving as an official Congressional Advisor to the Uruguay Round of Multilateral Trade Negotiations from 1988 until 1991, and later serving as a member of the Agricultural Technical Advisory Committee for Cotton, Oilseeds and Tobacco and an official adviser to the Doha Round of Multilateral trade negotiations. He is lead private counsel in the Brazil—U.S. WTO cotton dispute and has worked on the cutting edge of legal developments regarding the introduction of genetically enhanced commodities and the use of electronic warehouse receipts. Bill has represented agricultural businesses and marketing cooperatives. While in Washington, D.C., Bill wrote significant pieces of agriculture, agricultural trade, consumer, and conservation legislation as well as regulations implementing important conservation and agriculture programs. 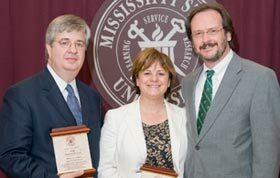 The Gillions were named the 2005 Alumnus of the Year for the Mississippi State College of Arts and Sciences. Bill is a member of the Tennessee and Georgia bars and is admitted before the U.S. Court of International Trade. They are active on local boards and volunteer organizations. He and Adrienne have two children and reside in Germantown, Tenn.